Schema definitions on replication slaves sometimes differ. Ability to rename schemas, tables and columns and still setup replication with comfort is useful for MySQL to MySQL replication, while for heterogeneous topologies like these, it's a must. In this article I'll present a component which I recently developed to enable an easy way of renaming database objects during both (a) initial slave load (provisioning) and (b) real-time replication. MySQL DBMS with some tables on the master. Empty Oracle DBMS on the slave. Tungsten Replicator with ddl-mysql-to-oracle.vm template available for ./ddlscan utility (translates MySQL schema dialect into Oracle dialect). CSV file with rename defitinions. schemam,tableu,colj,-,-,colj2 # Column renaming doesn't change schema/table. While working on one of the MySQL to Oracle replication projects for Continuent, I needed to implement an open-source utility for transforming MySQL schema to an Oracle dialect (DDL statements that create specific schema on Oracle) to save from otherwise tedious work. This article introduces ./ddlscan tool, which does that and is extensible to do much more. Your favorite DBMS with some tables. Currently supported MySQL, Oracle and PostgreSQL. Latest Tungsten Replicator build. Not even needed to install, enough to untar. Velocity template of your choice. You will find currently available ones in tungsten-replicator/samples/extensions/velocity/ folder. 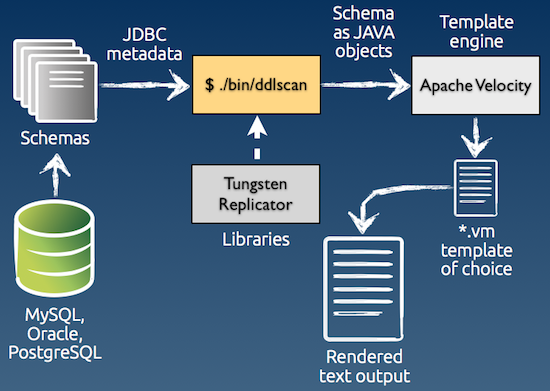 When you call ./ddlscan it uses Tungsten Replicator libraries and connects to the underlying DBMS through appropriate JDBC driver. There are classes in the Replicator which extract metadata from the requested schema. Tables, columns, keys and so on are identified and then provided as JAVA objects to the Velocity template-generating engine. Velocity templates are not hard to write. Here's an example of a template that reports tables without primary keys: ddl-check-pkeys.vm - if comments and headers were removed, it's only 3 lines of code (at least, at the time of writing this article). To make it easier to handle the syntax, use some plugin like veloedit. Finally, user receives a rendered result from applying schema metadata to a template. The mentioned transformation of schema dialects between different DBMS types. Automatic trigger generation for trigger-based replication or ETL tools. Staging tables generation for loading data warehouses (eg. 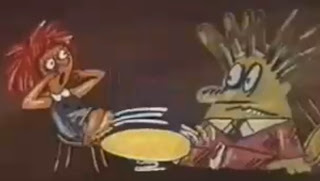 Vertica). Schema validation (scanning for potential issues). We have briefly reviewed how ./ddlscan tool works. More articles about specific use cases to come. Happy rendering! The open source Tungsten Replicator is very powerful. It's exciting to see how a flexible initial design allows to push the boundaries of replication with each new release. The recently published System of Record approach for multi-master databases does exactly this for multi-master databases. Nevertheless, in today's database environments it is often not enough to move data, however well it is done, between the nodes of a single DBMS vendor like MySQL. There is an entirely new set of challenges that appear when Oracle joins the Enterprise room. Thus, this article presents how Tungsten helps to interconnect the whole database picture by replicating data from MySQL to other vendors. This time I'll specifically glance at replication to Oracle. Heterogeneous replication - replication across different DBMS types. In other words, having software at your fingertips which can seamlessly (with some careful preparation though) move data from one DBMS type to another provides a lot more freedom in choosing the DBMS, which is best suitable for a particular task. Extract the last committed transaction from MySQL's binary log. Wrap the transaction with metadata, including Global Transaction ID. Filter (transform) it to conform to the taste of Oracle. Apply this transaction to Oracle. If succeeded, go to (1), if not - break the replication. After the error appeared, you can investigate it, fix it and resume. That's where the step (2) comes handy - Tungsten Replicator has global transaction IDs in heterogeneous replication too and hence knows where it stopped and where to resume. In this picture you can see all the mentioned components (Java classes) of the Replicator, including extractor, filters and applier. Let's drill down to each of them in a little more detail. This is the entry point. Every transaction that is written by MySQL to the binary log is extracted by the MySQLExtractor class. At this point, one of the primary challenges I come across when developing heterogeneous replication is, of course, SQL dialect differences. Almost naturally, each vendor has different DDL semantics, but not only that - you cannot rely on DML statements to be standardized either. Luckily, for MySQL there is solution - use row based replication. This is a great way to get all new transactions as row change data, as opposed to textual SQL strings. In other words, this is a very handy structure, which will be reconstructed into an Oracle-compatible SQL by the Oracle applier at the later stages. This, at the base level, covers the DML, but what to do with DDL statements? Leave them as is: if DDL is compatible with Oracle, it is applied, if not - replication breaks and DBA can investigate it. Usually, this is a good idea, because you will know if someone is executing unexpected DDLs against the cluster. 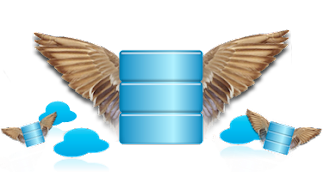 Transform DDL SQL into Oracle compatible one by the help of filters: if application generates some DDL statements by itself and they are possible to identify. Drop all DDL from the replication stream: useful during provisioning phase, when you're dumping a backup on the MySQL side and want data to be propagated to Oracle, which has the schema already prepared. Prepare DDL upgrade script for MySQL. Prepare DDL upgrade script for Oracle. Turn off binary logging on MySQL (SET SESSION SQL_LOG_BIN=0). Execute upgrade scripts against MySQL and Oracle. Turn the binary logging back on (SET SESSION SQL_LOG_BIN=1). EnumToStringFilter - MySQL saves ENUM column type values as indexes in the binary log; this filter maps the textual representation instead, so we'd save appropriate text values on the Oracle side, as opposed to meaningless numbers. To upper case filter - MySQL table and column names are usually lower case; this filter transforms the case to what Oracle likes. PrimaryKeyFilter - for UPDATE and DELETE row changes we strip down all the key-value pairs that are excessive in the WHERE clause, leaving only the primary key comparison. OptimizeUpdatesFilter - just like MySQL binary log is excessive in the key (WHERE) part, it has also abundant information in the SET part of an UPDATE; eg. if a table has hundred columns, but statement updates only one, the row change event will contain all the hundred columns updated; this filter strips abundant assignments and leaves only the columns that actually changed. And so the event, representing a transaction and holding the transformed-and-prepared-for-Oracle data change set, arrives to the doors of OracleApplier. The applier constructs a Prepared Statement, begins a transaction and links the values to it. Each row of the event is executed to Oracle. When it reaches the end of the event, this transaction is committed and data is ready for applications connected to the Oracle instance. The beauty here is that all the stages mentioned above are working in parallel. Each stage is separated from the other by queues, which work like buffers. Eg. extraction from MySQL binary log is usually very fast, thus it pushes the data to the queue, from which next stage is reading and so on, thus extraction is not blocked. 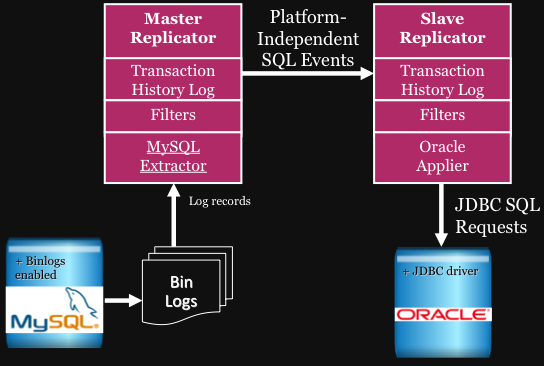 I have briefly shared with you how Tungsten Replicator implements real-time replication from MySQL to Oracle. Of course, each topic above could be extended into an article of its own, but for now I just invite you to download the latest Replicator release, try out the MySQL->MySQL replication and, when comfortable, MySQL->Oracle one. My colleague, Jeff Mace, had made it a lot easier to setup advanced topologies like these with recent additions to the tungsten-installer. Finally, heterogeneous replication projects like these are very fun to work on and I'm sure there will come more. Though cross DBMS type replication is primarily driven by customer demand and customers drive the priorities. 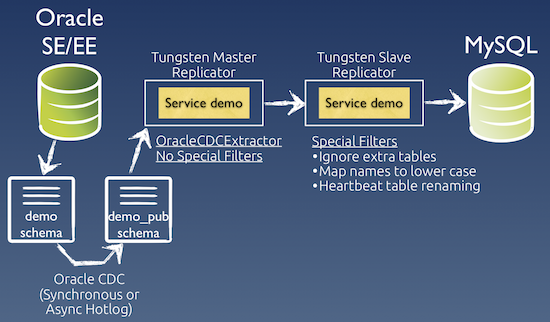 Open source Tungsten Replicator for MySQL enables multi-master, parallel and even heterogeneous replication, together with zero-down time schema upgrades, transaction filtering and more, but all these features are hardly available for another elephant in the room - i.e. PostgreSQL. At least, that was true until now. For a few years now I have been yearning for a user friendly and flexible replication mechanism for PostgreSQL. Especially, seeing how Tungsten grew and enhanced MySQL replication month after month, PostgreSQL development in this field seemed relatively limited. PostgreSQL 9 introduced Streaming Replication and Hot Standby support, which was a big step forward. After implementing support for these features in Tungsten, transparent connectivity and management features, which were already developed for MySQL, opened up for PostgreSQL too. Tungsten Replicator supports plugins, so the major work I've done was in Ruby scripts, which automatically manage WAL Shipping and Streaming Replication. They connected PostgreSQL to Tungsten features like transparent automatic failover, smart read load balancing, zero-dataloss master/slave switching and all others, which can work on a physical replication pair. Nevertheless, in order to unleash the big power in DBMS clustering, you need to have logical replication. Logical replication - data from one DBMS is copied to another as transactions. One can actually see each transaction as SQL statements or row change structures. This is where MySQL's Statement or Row Based Replication fall in. Physical replication - data from one DBMS is copied to another as differences in file system or table spaces. In other words, there is not enough transactional content in these evens to reconstruct the original statement or row change structure, thus this event can only be applied into a slave DBMS which is a bit-to-bit copy of the master. This is where PostgreSQL's WAL Shipping and Streaming Replication fall in. Have a different data and/or schema on the slave. Really, one can't change data on a slave at all (eg. a standby PostgreSQL server is read-only if you use Streaming Replication). Both of these items are essential if you want to implement multi-master, heterogenous or other features, described at the beginning of this article. So, how to implement a flexible and user friendly logical replication for PostgreSQL? For MySQL Tungsten Replicator extracts directly from the MySQL Binary Log files. It is possible to do that, as Binary Logs contain enough transactional information. Unfortunately, the same cannot be said about PostgreSQL XLOG files. Solution? Revert to the good old trigger based replication. Specifically, the time proven Slony. Transaction is completed on the master. Slony triggers fire and save the row changes in sl_log_1 or sl_log_2 tables. This is where Slony's responsibilities end. Tungsten's PostgreSQLSlonyExtractor reads from the log tables and structures the event in a DBMSEvent type. From now on generic Tungsten components do the remaining work. Event passes filtering and is saved in THL (Transaction History Log). Slave Tungsten Replicator extracts the event remotely, passes it through its pipeline down to the PostgreSQLApplier, which then executes this statement against the slave DBMS. Note: as illustration of flexibility, the very same PostgreSQLApplier is used when implementing heterogeneous MySQL->PostgreSQL replication. The new component here is the PostgreSQLSlonyExtractor, which initial implementation you may find at our code.google.com homepage. What is really nice, that the approach above stacks up inside the whole Tungsten Replicator architecture transparently and connects to all the components that are available and are being developing for MySQL. 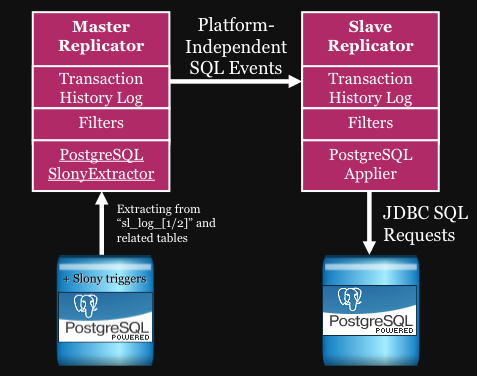 We have briefly reviewed the fresh logical replication method in Tungsten Replicator for PostgreSQL based on Slony logs. The real details and setup example are left for your enjoyment in the second part of this article. You are more than welcome to stay tuned! Welcome to a blog about DBMS, replication, clustering and related topics. Posting not too often - rather when there is something, hopefully, useful to share with fellow colleagues in this both wide and deep field.